For 21 years, Cardinal Joseph W. Tobin called Rome home. It’s the city where he served as the superior general of the approximately 5,300 Redemptorists around the world. It’s also where he ministered as the secretary—the second in authority—in the Vatican’s Congregation for Institutes of Consecrated Life and Societies of Apostolic Life, helping to guide the life and ministry of 1 million men and women religious around the world. It’s also where he earned a reputation for caring for the poor, the elderly and people with disabilities in Rome’s Primavalle neighborhood. “I was blessed in my two decades in Rome to have a lot of friends,” he recalled of his time in the Eternal City from 1991 through 2012. Yet, it’s also a destination that he didn’t initially embrace when he learned that he might be sent to Rome to serve in the leadership of his order. At the time in 1991, he was ministering in a largely Hispanic parish in Chicago. It wasn’t possible, but he was sent to Rome anyway. 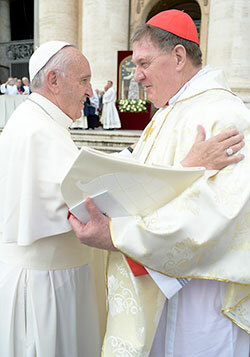 Cardinal Tobin took that advice to heart and, like a missionary, traveled to serve his order and the Church in dozens of countries around the world, including for 12 years as his order’s superior general. He recalled those years of leadership from 1997 to 2009 shortly after Pope Francis selected him as a cardinal on Oct. 9, 2016. “I was the superior general of the Redemptorists for 12 years,” Cardinal Tobin said. “In my final, circular letter to the congregation, I reflected on why God called me to do this work.